The wine cap (Stropharia rugosoannulata) is an excellent edible mushroom that can be harvested now. 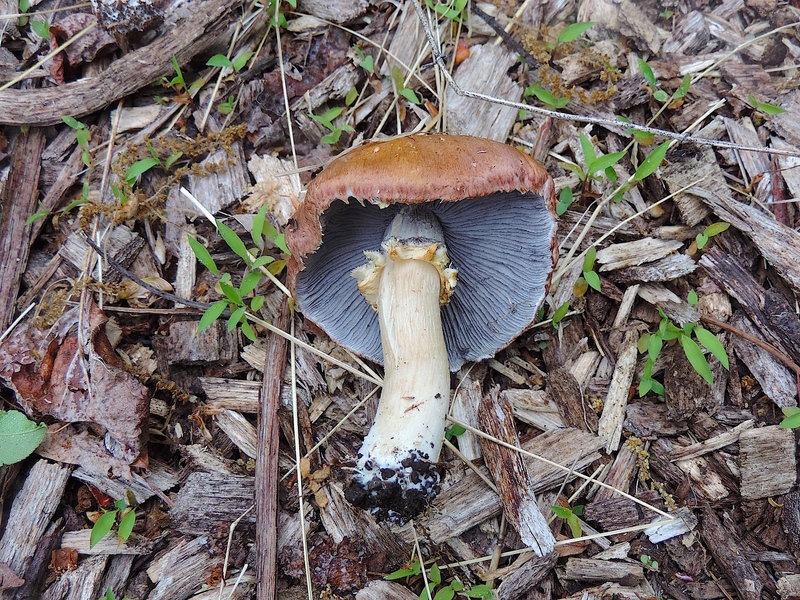 Note the reddish/brown cap with lilac gills, and the prominent ring. Older specimens will fade to a straw-like color with darkened gills. The spore print is very dark purple/black. Mushroom hunters like myself aren’t the only ones interested in wine caps. Researchers dig ’em just as much. A recent study found that a lectin (a protein that binds to a carbohydrate) from wine caps displayed anti-cancer activity against leukemia and liver cancer cells. Additionally, this lectin exhibited anti-HIV activity (Molecules 2014). Other research has found that an exopolysaccharide isolated from wine caps exhibited potent anti-tumor and antioxidative effects (International Journal of Medicinal Mushrooms 2012). Look for wine caps in mulch piles and wood chips, now through autumn in Pennsylvania. And tell ’em Adam sent ya.